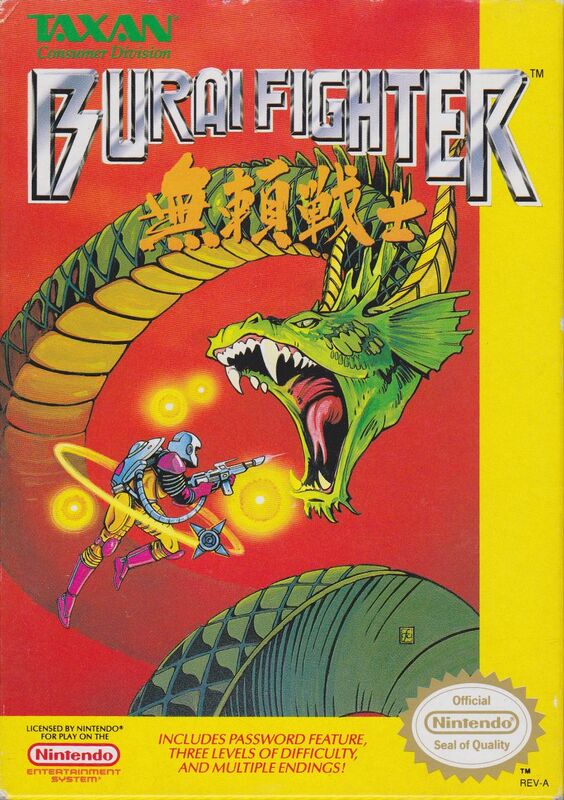 [Review] Burai Fighter – I ❤ Old Games! 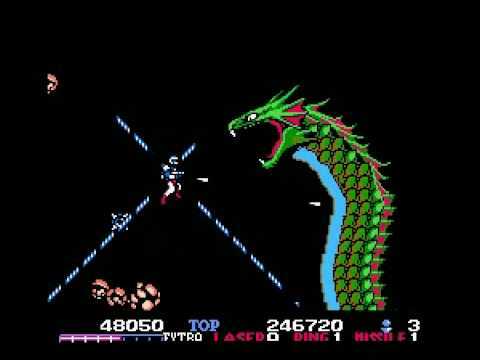 Burai Fighter is a good space shooting game made buy Taxan , a company specialized in this genre that released other good games for the NES. The game, released in 1990, was later ported on the Game Boy with the title Burai Fighter Deluxe and remade for the Game Boy Color with the title Space Marauder (Burai Fighter color in Japan). Burai Fighter is one of the games I’ve bough quite recently to expand my NES collection. To be honest I didn’t know it when I bought it but since it came for something like 2€ and I had already bought other games from the same seller I decided to go for it. I’ve (re)discovered it even more recently during a rainy day when I didn’t know what to play and I got caught by that Dragon Ball style dragon on the label. Even though it has some limitations and the shoot ’em up is not my genre, I’ve found it very playable and a good choice for a pastime. Not a masterpiece, but the world needs needs also these kind of games. The big pro of the game is that it can display a lot of moving sprites al at once without any slowing or flickering. Unfortunately however the graphics are a bit rudimental, even though they’re colourful and, in some stages, even fluid when everything is moving fast. The first impression is that our protagonist is attached to the background like it was a sticker. It’s like the proportions and the perspective were completely random. We understand from the booklet that the scrawny plot revolves around an unnamed hero that travels across seven facilities of the superior race of the Burai, spread all over the galaxy in hit task to defeat them to prevent them to take over the entire universe. It is the classic good-humans against evil-aliens plot declined this time in the form of a space shooter that doesn’t innovate the genre. 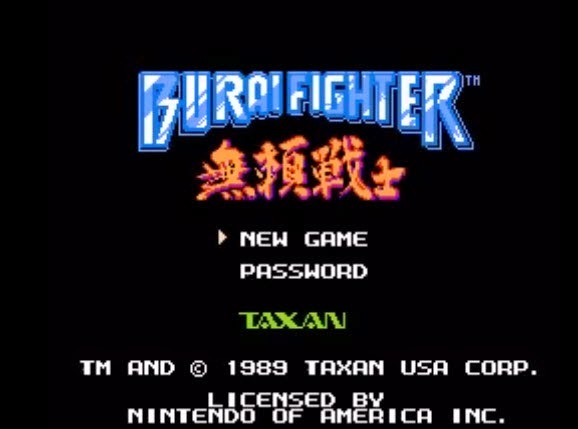 It’s like if you take a space shooter game of the early 80s and you change the name of the protagonists: here’s Burai Fighter. Burai Fighter is a linear space shooter and the gameplay is limited to defeating storms of enemies, classic final bolsses and collect power-ups. This time the leading character is not a spaceship as in all the space shooters but an actual human dressed with a space suit and armed with a sort of gun that can shot projectiles, laser or missiles. Every weapon can be upgraded twice, collecting the specific power-ups: every 5 PU you get un upgrade that consist in an increased amount of fire, since you can shoot in two or four directions (with the maximum upgrade). Sometime when you kill an enemy you can also collect some small red spheres that increase your energy bar” and when is full you’ll be rewarded with an extra life. You can convert part of this bar in bombs: this is the most powerful weapon of the game and, although it has no effect on the bosses, it can be used to clean the screen once it starts to get to busy with bullets and enemies. Everytime you use a bomb your bar goes down a notch. These spheres you collect are very similar to the projectiles the enemies fires at you so you have to be very careful because in some situation with a lot of stuff on screen you can easily be confused: that’s the moment you’ll most likely use the bombs. Using them can be also a good strategy to collect spheres without getting hurt. When you have the screen too crowded of dangerous stuff, throwing a bomb cas be seen not as a waste of resources but a way to increase them: a notch consist of four spheres and if you kill a lot of enemies at once you can be rewarded with more than 4 spheres. There’s no proper lifebar in the game so everytime you get hit you lose a life, even though there’s also the possibility to have unlimited continue. A total of 7 level are available with three different difficulties plus a fourth one that can be unlocked. This one, along with the hardest “standard” difficulty level, rewards the player with the “official” graphic ending of the game. Since I’ve completed the game at the easiest level, I stil haven’t seen in person this ending and I don’t even want to spoil it myself. I will wait for it until I’ll get good enough to complete easily the hardest level. The password system used in the game comes as a blessing if you’re not so good at the game because it allows you to restart the game from the last checkpoint. Once a level is completed the game gives you a 4-digits password easy to remember that you can insert at the beginning of a new game so you can save your progresses and avoid to restart from the beginning everytime. While this can be handy if you want just to complete the game, on the other hand it lowers a lot the challenging part of the game itself: trying to reach the end with no help. This, of course, affects also the longevity that is vastly decreased and the replay value of the game, since it’s most likely that you won’t play the first stages anymore and you’ll be more concentrated with the later ones. Burai Fighter is awesome. I actually have it on both the NES, and Game Boy. The GB version is also interesting in how it’s been altered to fit on the handheld. It plays similarly, but with the altered levels it’s almost like Director’s Cut extras on a DVD. It’s worth checking out both! Pingback: [Editorial] Guess what’s next on I ❤ Old Games! – 10/12/17 – I ❤ Old Games! Pingback: [Editorial] Guess what’s next on I ❤ Old Games! – 13/01/19 – I ❤ Old Games!